Sports performance! We all want more of it! There are all sorts of potions and supplements out there that will claim to boost the hard work we’re doing on the track – but what really works and what’s a scam? Since Booty and I only want what’s best for you, we decided to put on our research hats, and look into some of the most popular supplements and sports performance boosters out there to see what’s what! 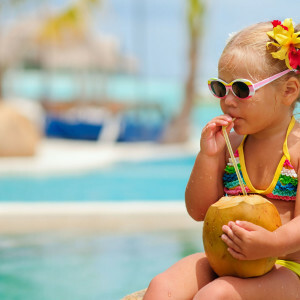 Coconut water is the liquid that you find inside a young, green coconut. It contains sugars, vitamins, minerals, amino acids, electrolytes and enzymes. Well, yes, for the most part. It does do all of things it claims, but it also tends to fall prey to a lot of over-hype. A 2011 ConsumerLab.com study found that many of the commercially available coconut waters failed to live up to their ingredient claims, falling short on inclusion of sodium, potassium and various minerals. Since the study, labeling has gotten more strict, but you should still be wary of any too-good-to-be-true health claims. Ounce per ounce, most unflavored coconut water contains 5.45 calories, 1.3 grams sugar, 61 milligrams (mg) of potassium, and 5.45 mg of sodium compared to Gatorade, which has 6.25 calories, 1.75 grams of sugar, 3.75 mg of potassium, and 13.75 mg of sodium. Coconut water does provide hydration, given that you drink a crap-ton of it. It’s better suited to mild hydration needs, rather than massive sessions of perspiration. With excessive exercise (like, more than 3 hours or in extreme heat), you are losing more sodium than potassium through your sweat and coconut water isn’t a great source of sodium. In those situations, you need easily-absorbed carbs to boost your energy from a source containing potassium and sodium – such as a handful of salty trail mix and a banana. So, should I drink it? If you can tolerate the taste*, it likely won’t do you any harm. It’ll help you hydrate about as much as any other sports drink and isn’t made of chemicals. If you’re using it for basic hydration needs, rather than extreme situations, it’ll get the job done. Then again, so will plain water and some well-planned halftime snacks. * I think coconut water is super-gross tasting, so it is not a viable hydration option for me. If you love it, go forth, drink coconut water and be mildly hydrated!